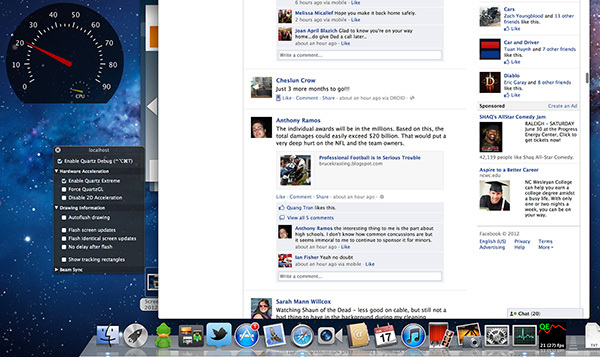 As I mentioned earlier, there are quality implications of choosing the higher-than-best resolution options in OS X. At 1680 x 1050 and 1920 x 1200 the screen is drawn with 4x the number of pixels, elements are scaled appropriately, and the result is downscaled to 2880 x 1800. The quality impact is negligible however, especially if you actually need the added real estate. As you’d expect, there is also a performance penalty. At the default setting, either Intel’s HD 4000 or NVIDIA’s GeForce GT 650M already have to render and display far more pixels than either GPU was ever intended to. At the 1680 and 1920 settings however the GPUs are doing more work than even their high-end desktop counterparts are used to. In writing this article it finally dawned on me exactly what has been happening at Intel over the past few years. Steve Jobs set a path to bringing high resolution displays to all of Apple’s products, likely beginning several years ago. There was a period of time when Apple kept hiring ex-ATI/AMD Graphics CTOs, first Bob Drebin and then Raja Koduri (although less public, Apple also hired chief CPU architects from AMD and ARM among other companies - but that’s another story for another time). You typically hire smart GPU guys if you’re building a GPU, the alternative is to hire them if you need to be able to work with existing GPU vendors to deliver the performance necessary to fulfill your dreams of GPU dominance. In 2009 Apple hired Drebin and Koduri. But there has been a fundamental shift since 2007. Great graphics performance is required, but it isn't sufficient anymore. If you look at what users are demanding, they are demanding an increasingly good experience, robust experience, across the spectrum of visual computing. Users care about everything they see on the screen, not just 3D graphics. And so delivering a great visual experience requires media performance of all types: in games, in video playback, in video transcoding, in media editing, in 3D graphics, and in display. And Intel is committed to delivering leadership platforms in visual computing, not just in PCs, but across the continuum. Otellini’s keynote would set the tone for the next few years of Intel’s evolution as a company. 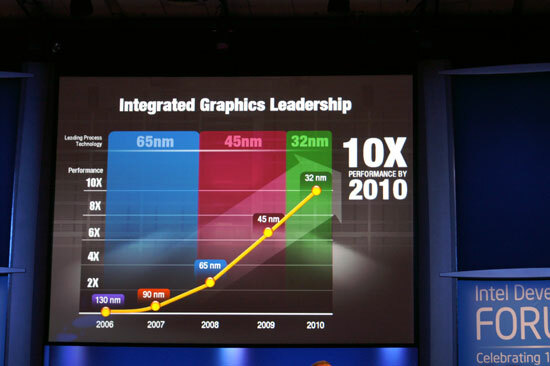 Even after this keynote Intel made a lot of adjustments to its roadmap, heavily influenced by Apple. Mobile SoCs got more aggressive on the graphics front as did their desktop/notebook counterparts. At each IDF I kept hearing about how Apple was the biggest motivator behind Intel’s move into the GPU space, but I never really understood the connection until now. The driving factor wasn’t just the demands of current applications, but rather a dramatic increase in display resolution across the lineup. It’s why Apple has been at the forefront of GPU adoption in its iDevices, and it’s why Apple has been pushing Intel so very hard on the integrated graphics revolution. If there’s any one OEM we can thank for having a significant impact on Intel’s roadmap, it’s Apple. And it’s just getting started. Sandy Bridge and Ivy Bridge were both good steps for Intel, but Haswell and Broadwell are the designs that Apple truly wanted. As fond as Apple has been of using discrete GPUs in notebooks, it would rather get rid of them if at all possible. For many SKUs Apple has already done so. 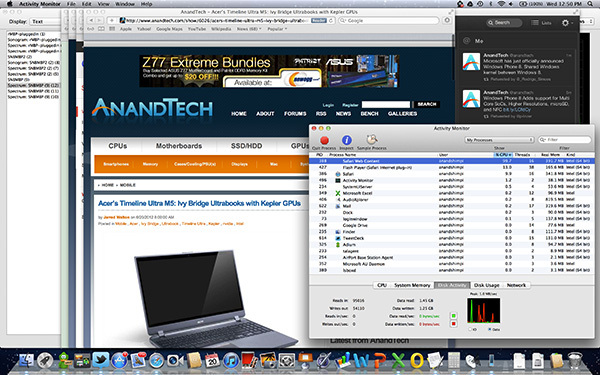 Haswell and Broadwell will allow Apple to bring integration to even some of the Pro-level notebooks. To be quite honest, the hardware in the rMBP isn’t enough to deliver a consistently smooth experience across all applications. At 2880 x 1800 most interactions are smooth but things like zooming windows or scrolling on certain web pages is clearly sub-30fps. At the higher scaled resolutions, since the GPU has to render as much as 9.2MP, even UI performance can be sluggish. There’s simply nothing that can be done at this point - Apple is pushing the limits of the hardware we have available today, far beyond what any other OEM has done. Future iterations of the Retina Display MacBook Pro will have faster hardware with embedded DRAM that will help mitigate this problem. But there are other limitations: many elements of screen drawing are still done on the CPU, and as largely serial architectures their ability to scale performance with dramatically higher resolutions is limited. The GPU has an easy time with its part of the process but the CPU’s workload is borderline too much for a single core to handle. Throw a more complex website at it and things get bad quickly. Facebook combines a lot of compressed images with text - every single image is decompressed on the CPU before being handed off to the GPU. Combine that with other elements that are processed on the CPU and you get a recipe for choppy scrolling. To quantify exactly what I was seeing I measured frame rate while scrolling as quickly as possible through my Facebook news feed in Safari on the rMBP as well as my 2011 15-inch High Res MacBook Pro. While last year’s MBP delivered anywhere from 46 - 60 fps during this test, the rMBP hovered around 20 fps (18 - 24 fps was the typical range). Remember at 2880 x 1800 there are simply more pixels to push and more work to be done by both the CPU and the GPU. It’s even worse in those applications that have higher quality assets: the CPU now has to decode images at 4x the resolution of what it’s used to. Future CPUs will take this added workload into account, but it’ll take time to get there. The good news is Mountain Lion provides some relief. At WWDC Apple mentioned the next version of Safari is ridiculously fast, but it wasn’t specific about why. It turns out that Safari leverages Core Animation in Mountain Lion and more GPU accelerated as a result. Facebook is still a challenge because of the mixture of CPU decoded images and a standard web page, but the experience is a bit better. 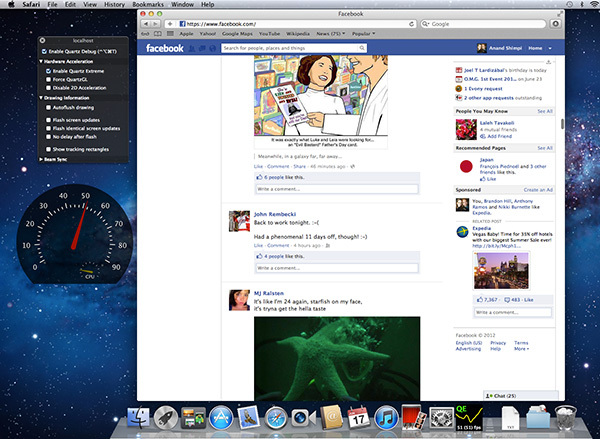 Repeating the same test as above I measured anywhere from 20 - 30 fps while scrolling through Facebook on ML’s Safari. Whereas I would consider the rMBP experience under Lion to be borderline unacceptable, everything is significantly better under Mountain Lion. Don’t expect buttery smoothness across the board, you’re still asking a lot of the CPU and GPU, but it’s a lot better. "...fastest of the dual core i7's while..."
I looked up the current model. Vaio Z: 13 inch display 1920 by 1080, maximum 8 gigs ram, 512 ssd, quad core i7 2.1/3.1 , USB 3. However, no thunderbolt, only integrated graphics and the price for the 13 inch computer as above is $2999. Does not compare to the retina macbook pro which has a higher resolution 15 inch display, thunderbolt, significantly faster processor, and discrete graphics with a gig of vram. The price for the better retina macbook pro with the 512 gig flash drive is $2799. The Sony you linked to doesn't have discrete graphics. You have to buy (and use) the docking station to get that. If you load it up with 8 GB of RAM (which is the max, while the rMBP goes to 16 GB), a 256 GB SSD, a 10% slower CPU (2.1 versus 2.3 GHz), no discrete graphics, and a "HD" non-IPS display, it costs you $1,950 versus the rMPB's $2,200. For the price Sony charges for the upgrade to 512 GB of SSD ($600), you can upgrade the rMBP, to a 512 GB SSD and get a 20% faster (2.6 GHz) CPU thrown in as well. The non-IPS display means that even if the rMBP didn't have incredibly more pixels, it would still outclass the Sony display in terms of contrast, viewing angle, etc. It is an IPS display, but non-glossy. Don't bother comparing the 2 as apples to apples, because they're not comparable. The sony is 2.5 lbs versus 4.5 lbs for the macbook pro retina. You have a whole different power and heat envelope. I don't disagree that Sony is overcharging for the high end Z, and now with the retina macbook pro maybe they will lower prices (this is really the first contender, but it is 15" so targets a different market segment). Wow that Sony VAIO Z Series is impressive! Overall size less than a typical 15" via a thin bezel. Excellent Keyboard/Trackpad and great build quality.